This is the equivalent of suggesting that since the average male dies at 88-years of age if he lives to be 100, he has no more chance of dying in the next 12-months than he did when he was 40-years old. While a 100-year old male will likely expire within a relatively short time frame, it will not just “being old” that leads to death. It is the onset of some outside influence such as pneumonia, infection, organ failure, etc. that leads to the eventual death as the body is simply to weak to defend itself. While we attribute the death to “old age,” it was not just “old age” that killed the host. First, averages and medians are great for general analysis but obfuscate the variables of individual cycles. To be sure the last three business cycles (80’s, 90’s and 2000) were extremely long and supported by a massive shift in a financial engineering and credit leveraging cycle. The post-Depression recovery and WWII drove the long economic expansion in the 40’s, and the “space race” supported the 60’s. But each of those economic expansions did indeed come to an end. 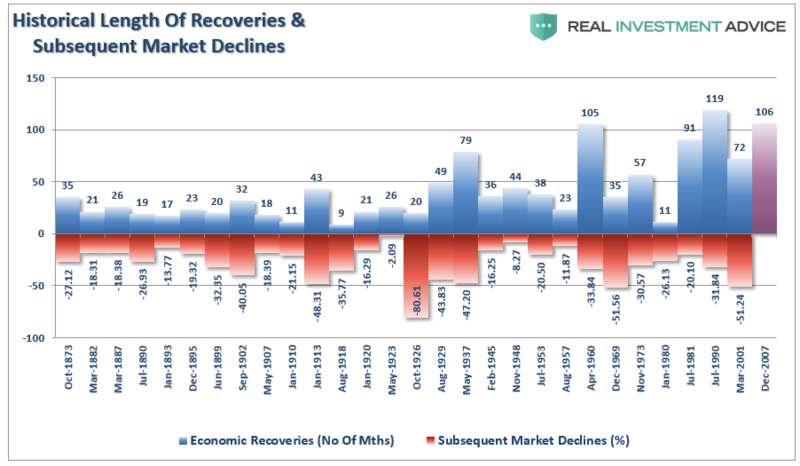 The table below shows each expansion with the subsequent decline in markets. 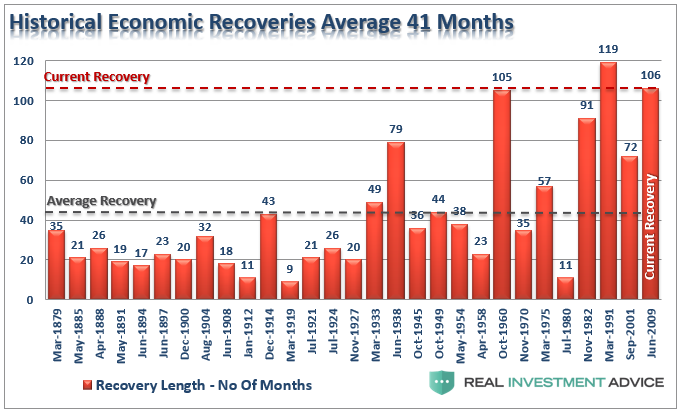 At 104 months of economic expansion in 1960, no one assumed the expansion would end at 105 months. At 118 months no one assumed the end of the “dot.com mania” was coming in the next month. In December of 2007, no one believed the worst recession since the “Great Depression” had already begun. The problem for investors, and the suggestion that “bull markets don’t die of old-age,” is that economic data is always negatively revised in arrears. The chart below shows the recession pronouncements by the National Bureau Of Economic Research (NBER) and when they actually began. As noted by David Rosenberg, with the Fed continuing to hike rates in the U.S., tightening monetary conditions, the previous 3-year time horizon is now substantially shorter. 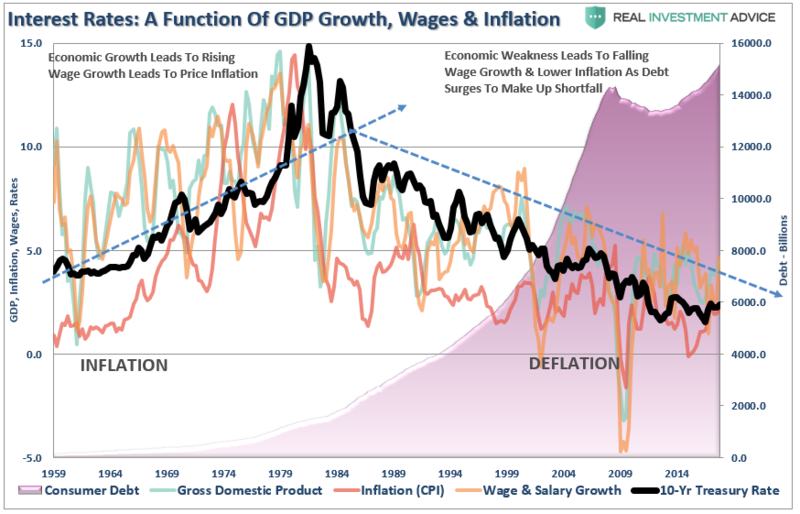 More importantly, the “average” time frame between an initial rate hike and recession was based on economic growth rates which were substantially higher than they are currently. Debt servicing requirements reduce future productive investment. The housing market. People buy payments, not houses, and rising rates mean higher payments. Higher borrowing costs which lead to lower profit margins for corporations. Stocks are cheap based on low-interest rates. When rates rise, markets become overvalued very quickly. The economic recovery to date has been based on suppressing interest rates to spur growth. Corporate share buyback plans, a major driver of asset prices, and dividend issuances have been done through the use of cheap debt. Corporate capital expenditures are dependent on borrowing costs. When rate hikes are combined with a surge in oil prices, which is a double whammy to consumers, there has been a negative outcome as noted by Peter Cook, CFA last week. “A better record of predicting recessions is achieved when Fed has hiked rates by 2.00%-2.50%, AND oil prices have at least doubled. The price of money and energy are major financial inputs to financial planning, so when they simultaneously rise sharply, consumers and businesses are forced to retrench. Based on the Fed’s well-communicated strategy, it plans to raise rates another 0.75% during 2018 on top of the previous 1.50% over the past few years. If crude oil stays above $50-60, both conditions for a recession would be met in the second half of 2018. In the past, when Americans wanted to expand their consumption beyond the constraint of incomes they turned to credit in order to leverage their consumptive purchasing power. Steadily declining interest rates, and lax lending standards, put excess credit in the hands of every American. Such is why, during the 80’s and 90’s, as the ease of credit permeated its way through the system, the standard of living seemingly rose in America even while economic growth slowed along with incomes. “With a deficit between the current standard of living and what incomes, savings and debt increases can support, expectations of sustained rates of stronger economic growth, beyond population growth, becomes problematic. 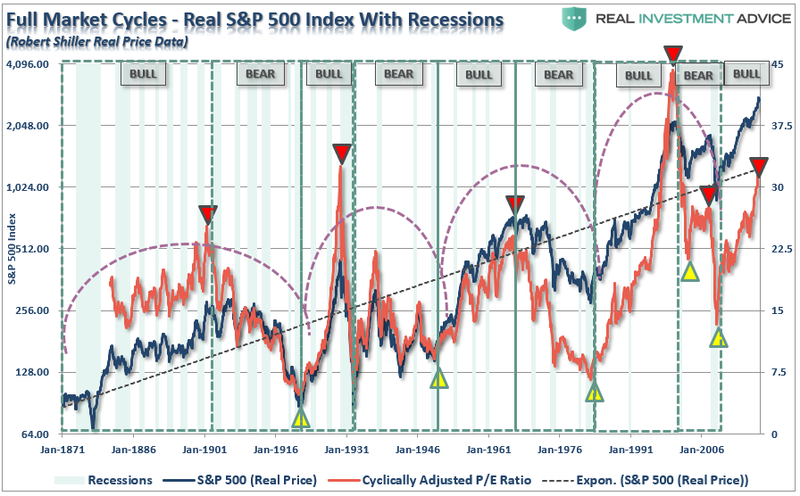 Lastly, it isn’t an economic recession that is truly problematic for investors. If asset prices rose equally with increases in earnings, in other words the price-to-earnings ratio remained flat, then theoretically “bull markets” would last forever. Take a look at the chart below which is Robert Shiller’s monthly data back to 1871. The “yellow” triangles show periods of extreme undervaluation while the “red” triangles denote periods of excess valuation. Not surprisingly, 1901, 1929, 1965, 1999, and 2007 were periods of extreme “euphoria” where “this time is different” was a commonly uttered phrase. It is the impact of an exogenous event on an over-leveraged, extended and over-valued market that eventually leads to its death. Ignoring the “infections,” and opting for “hope,” has always led to emotionally driven mistakes which account for 50% of investor’s under-performance over a 20-year cycle. With expectations rising the Fed will further tighten monetary policy, the vulnerabilities of an “aged bull market” will be an issue for investors in the future.